On this day in 1974, in a radio and television broadcast from the Oval Office, Richard Nixon announced that he was resigning as President of the United States. This year marks the 40th anniversary his his resignation. (Click here to watch his speech. Click here to view the full speech). 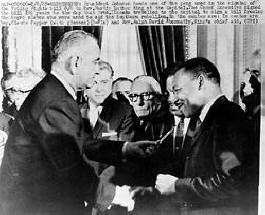 On this day in 1965, the Voting Rights Act was signed into law, protecting all U.S. citizens from racial discrimination while voting.